If you are looking to make homemade butter, you will be glad to know that the steps involved are extremely easy. It will not be wrong to say that it is possible to make your cooking a little bit more special by preparing butter at home. In addition to being very cost effective, homemade butter is healthy since it contains valuable minerals, unsaturated fats and vitamins. It adds a great touch to any holiday or consider carrying out a fun project to accomplish with your children by following some simple steps and techniques. Before doing anything else you will need to make sure that you have some basic cooking knowledge and skills to perform this task. Once you have made up your mind about making homemade butter at home, consider sterilising a jar. This can be done by cleaning the jar with boiling water and then drying it using a piece of cloth. Make sure the jar is properly rinsed to avoid a soapy taste in your homemade butter. Fresh cream can be easily purchased from your local dairy shop. Allow the cream to sour by leaving it out for a while. 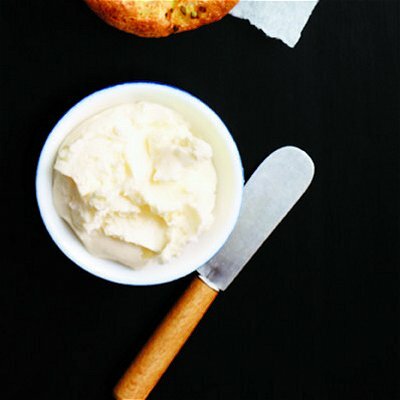 Make sure the cream appears shiny with an acidic texture before using it for making homemade butter. You will be required to churn the cream, a process which is typically carried out at 70 degrees C. Shake and swirl the jar slowly. Continue to shake the jar until the small spot pellets of butter start forming. Usually, the process of butter formation in the jar takes 30 to 40 minutes. Add cream to the mixture and wait until the butter starts to appear solid. You can use the residual buttermilk for several other recipes such as biscuits or ice cream. Clean your solid butter. This can be done by placing the butter in a cheese cloth and cleaning it with cold water, making sure the butter does not lose its original texture. This process will also help you to remove any residual buttermilk. Place your homemade butter in a bowl and add salt to as per your liking. Shape of the butter can be formed by using a wooden spoon.